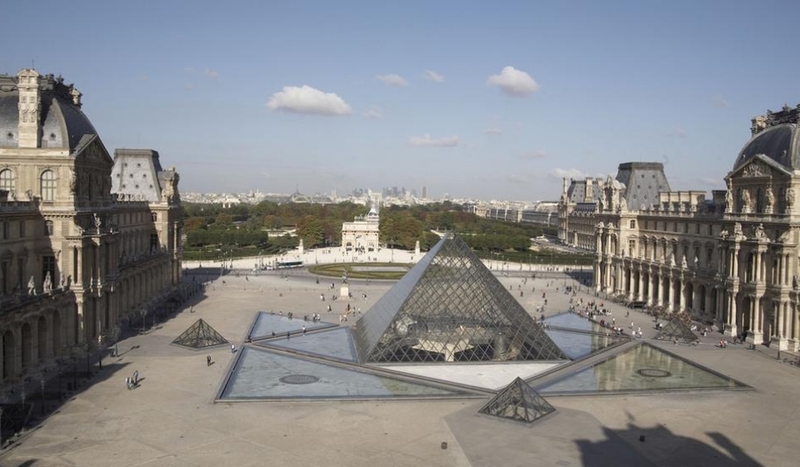 A masterpiece in glass and steel, the Louvre Pyramid is now 30 years old. We take a look at the extraordinary backstory of this iconic diamond-like structure and at the new, avant-garde glass form it has conceived. The Louvre has five pyramids in total: three small replicas in the main courtyard, a time-inverted pyramid beneath the Carrousel du Louvre and, of course, the Louvre Pyramid. 793 Saint-Gobain extra clear laminated glass panel shapes form the Louvre Pyramid: 675 diamonds and 118 triangles. The Louvre Pyramid is the Louvre’s third most visited work after the Mona Lisa and Venus de Milo – a fitting tribute to this architectural and technological masterpiece. Designed by Chinese-American architect Ieoh Ming Pei, the shining diamond’s uncompromisingly contemporary outline and jewel-like transparent facets counterbalance the classicism of the Cour Napoléon. With its 35.24-m (115.62 ft) square base and 21.64-m (71 ft) apex height, the Pyramid is a precise miniature of the Great Pyramid of Giza. This was no doubt a monumental construction project, with a technical complexity akin to its Ancient Egyptian predecessor. It came with an added challenge: create a central entrance to the world’s most visited museum that seamlessly directs visitors to 14.5 kms (9 miles) of corridors and 403 rooms. Hence the idea of an underground reception area in the middle of the Cour Napoléon to streamline visitor flows. But that didn’t address the challenge of needing to bring natural daylight into the corridors using a light well. What’s more, would such an entrance end up looking like a subway station? Presented with this multi-faceted challenge in 1984, Ieoh Ming Pei conceived a fully glazed and totally transparent structure. A raw diamond cut from glass. Not to be hung on the wall like a painting, but to be viewed in 3-D as a masterpiece. Something alive. Something seeming to float above the ground... A pyramid. To outraged traditionalists, this was unadulterated heresy. To others, truly revolutionary architecture – a jewel of modern art. In 1985, a commission was issued to find a type of glass that was transparent enough, light enough and strong enough to cover the Pyramid. Saint-Gobain rose to the challenge by creating an exceptionally innovative glass form, called “Diamond Glass.” Months of exhaustive research went into the development of this 21.52mm extra clear laminated glass, with its exceptional mechanical properties and high optical quality. Such a technical feat ultimately required the construction of a “new generation” electric furnace, capable of reducing iron oxides (what gives most glass its greenish hue). Over four years, its steel frame was bent, twisted and distorted so as to level the surfaces of its lantern without compromising strength and lightness. It worked. 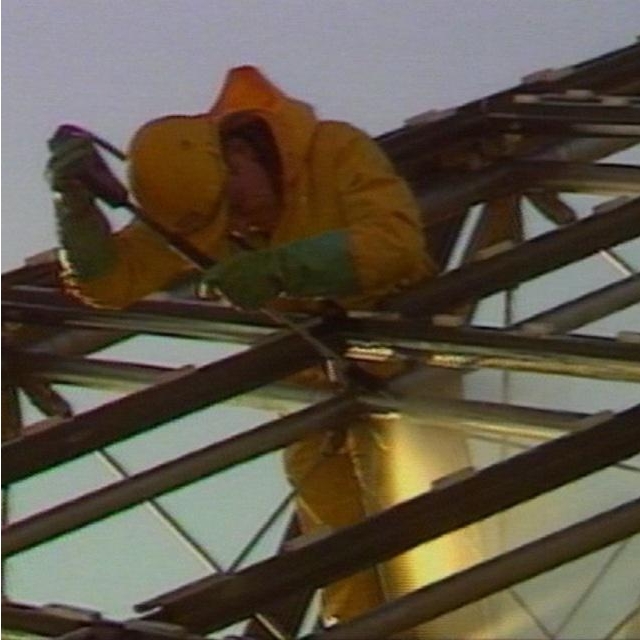 On 30 March, 1989, the Pyramid was officially opened by President François Mitterrand. Two days later on 1 April, Pei's masterpiece welcomed its first visitors. Today, the Louvre Pyramid stands as a jewel of innovation. Not only has it brought the world’s most famous museum entrance, its 675 diamonds and 118 triangles have become one of its most complex architectural puzzles. Conspiracy theorists have perpetuated the myth that the Pyramid contains 666 glass diamonds; the demonic signifier has even been referenced in Dan Brown’s bestseller The Da Vinci Code. Argue what they will, the Pyramid actually contains 793 glass panels, shards of which will be sold publicly to mark its 30th anniversary. Now everyone can have their own Louvre Pyramid.